Things seem to have slowed way down since we crossed Mobile Bay… The winds have been light and the waters have been calm. We’ve been anchoring out for some days, I forget how many… I guess my mind has slowed down as well. We came upon Alabama proper as we entered the ICW and passed beneath the Portgate Creek bridge and no trip to Gulf Shores would be complete without a stop at Lulu’s! Last time we were in the area, we stayed with our friends from BYC, Lynn and Susan, who now live in Alabama. They brought us by Lulu’s but we didn’t stop, mainly because our Hostess had the most delicious and decadent meal of our lives in store for us that evening… so I guess you could say that we were going back to finish what we’d started those several years ago. We called up our friend again, and Lynn met us at the dock! Susan was baking as it’s Christmas in just over a week, so she got a pass… I totally understand! Anyhow, we made a perfect landing at the dock, right on the ICW and had a great meal with our old friend. He gave us all kinds of tips and tricks for the upcoming part of our cruise. He also offered us a ride to West Marine for the Chart Book of the Western Florida Coast, which we desperately needed and had no idea how we were going to get… It was kind of cool going over the bridge we had just passed beneath and I was able to get a cool picture of our boat docked at Lulu’s from the top. Thank you so much Lynn for the ride and the lunch! We said our goodbyes and made it as far as Ingram’s Bayou for the night. We were trying to make Robert’s Bayou AKA Pirates Cove, but we didn’t want to chance having to navigate the entrance in the dark or failing light. It’s known to be a bit tricky. Ingram’s Bayou was quiet and beautiful, kind of like the Mermentau anchorage back in Louisiana, only smaller. We followed another sailboat in and settled for an utterly quiet and peaceful night. The air is so fresh and still. The moon rose through the trees and bathed the cove in a watery silver light. Morning found us chilly but well rested. We checked the weather and found that we have some days to kill while waiting out high winds later in the week. We really didn’t need to be anywhere and Pirate’s Cove seemed like just the place. So, we weighed anchor and motored the whopping three miles around the corner to the Cove. We made it through and the cove opened up at our bow. We picked our spot and dropped anchor in the very soft mud. It was so soft that when I backed down to set the anchor, we stirred up mud making our depth sounder freak out… and had it not been for the fact that this has happened recently in other spots, I might have been nervous. The day was young and it was sunny with the promise of warmth. We took off in the dinghy, marveling that we could almost see the keel and rudder, and the swim ladder was plainly visible. We haven’t seen clear water under our own boat, EVER! The cove is just lovely, it would be a wonderful place to live, if one were going to live in a place… We had a nice little spin around and then headed back out of the cove and across to the other side of the ICW to check out the facility at Bear Creek Marina. Good thing we did too, as they were closed. Until January 30th!!! Can they do that? So, our planned spot for the next few nights was dashed. To sooth ourselves, we sped back to Pirate’s Cove and docked there to go in and see what all the fuss was about. The place was nearly deserted, just a few locals hanging around and some dogs. To say that the place is laid back would be an understatement. I could imagine it being a happ’nin place maybe in the summer and in the dark… There were things hanging from the ceilings and old sails stretched out from corner to corner with things written all over them. It was kind of shabby, but it had the feeling of being “somewhere else”… How do I describe it, maybe in Jamaica or Grenada… and yet a certain hillbilly-ness. That’s the best I’ve got. 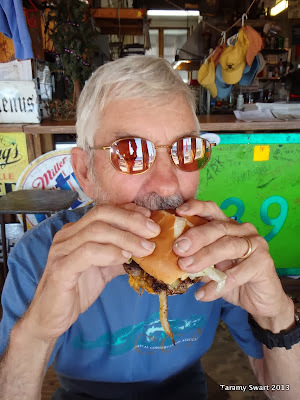 We ordered two burgers and some onion rings… and a Bushwhacker! What is that? It’s their signature drink. Had I not seen two gentlemen come in and buy some just before us, I would never have known… That would have been a monumental shame as it was rum and ice-cream and who knows what else all rolled up in chilly goodness. And it was awesome! The burgers were tall and juicy and paradisiacal in the extreme! We were happy campers! I have nothing like this on the boat to cook… And now… as the guy sitting on the porch when Bruce took my picture… Now, we can say that we’ve BEEN here! Glad all is well and damn ... the burger looks good! LOL, yes I must have my rant now and then... We are having a blast and the highs to lows ratio is still weighing very much on the high side. Get out here girl! Yes I will have to stop at this place....If I don't I will never forgive my self. There are many places along the way that you will find are "must-do's". Rites of passage even... I think we tend to stay out of crowded spots, this can be one of those... but we came through off season and during the week, as opposed to a weekend, where I understand this place can be "jumpin'". It was quiet and peaceful when we stopped by.